El 15 de febrero de 1898 se convirtió en una fecha clave para la historia de Cuba tras haber sido hundido en la bahía de La Habana el acorazado Maine, del Escuadrón del Atlántico Norte de la marina estadounidense. El hecho ocurrió a las 9:40pm y tuvo como consecuencia la muerte de 266 personas, entre oficiales y soldados, aunque seis de ellos fallecieron después, producto de las heridas sufridas [ver nombres]. Tres semanas antes, el 25 de enero, el Maine había entrado a la capital cubana para proteger los intereses de los estadounidenses en la isla, debido al estado de guerra en que se encontraba el país entre los independentistas y el gobierno colonial español. La explosión del Maine tuvo repercusiones inmediatas en la prensa de los países involucrados y, por supuesto, conllevó a que se tomaran medidas urgentes con respecto a su investigación para aclarar los motivos del siniestro. El gobierno de los Estados Unidos creó una comisión con tal fin, dirigida por el entonces capitán WilliamSampson. Los resultados fueron emitidos el 21 de marzo y señalaron que el hecho no había sido negligencia de los oficiales o la tripulación, sino que el Maine había sido destruido por la explosión de una mina submarina, aunque no tenían evidencias para establecer la responsabilidad sobre alguna persona en particular [ver informe]. Comisión para la investigación del hundimiento del Maine. Lo cierto es que un mes después, el gobierno estadounidense comenzaba el bloqueo a Cuba y declaraba oficialmente la guerra a España. El hundimiento del Maine constituyó uno de los factores para la declaración de guerra, al punto que muchos investigadores han insinuado que haya sido una estrategia planificada para justificar la participación de los Estados Unidos en la guerra hispano-cubana. En 1911, los restos del acorazado y parte de su tripulación fueron rescatados de la bahía habanera. Los fallecidos habían sido enterrados originalmente en el cementerio de Colón, en La Habana, aunque al año siguiente serían trasladados al Cementerio Nacional de Arlington. 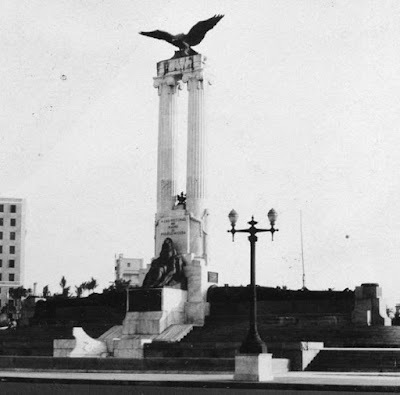 En 1915 se construyó el monumento en dicho cementerio con el mástil principal del Maine como atributo representativo. En La Habana se erigiría una década después, en 1925, en el malecón, aunque sufrió varias modificaciones a lo largo del tiempo. Fuente: Appendix to the Report of the Chief of the Bureau of Navigation, 1898 (Washington, D.C.: Government Printing Office, 1898). Key West, Fla., Monday, March 21, 1898—10 a.m. The court met pursuant to the adjournment of yesterday. Present: All the members and the judge-advocate. The record of last day’s proceedings was read over and approved. The court was then cleared for deliberation. 1. That the United States battle ship Maine arrived in the harbor of Habana, Cuba, on the 25th day of January, 1898, and was taken to buoy No. 4, in from 5½ to 6 fathoms of water by the regular Government pilot. The United States consul-general at Havana had notified the authorities at that place, the previous evening, of the intended arrival of the Maine. 2. The state of discipline on board the Maine was excellent, and all orders and regulations in regard to the care and safety of the ship were strictly carried out. All ammunition was stowed in accordance with prescribed instructions, and proper care was taken whenever ammunition was handled. Nothing was stowed in any one of the magazines or shell rooms which was not permitted to be stowed there. The magazines and shell rooms were always locked after having been opened, and after the destruction of the Maine the keys were found in their proper place in the captain’s cabin, everything having been reported secure that evening at 8 p.m. The temperatures of the magazines and shell rooms were taken daily and reported. The only magazine which had an undue amount of heat was the after 10-inch magazine, and that did not explode at the time the Maine was destroyed. The torpedo war heads were all stowed in the after part of the ship, under the ward room, and neither caused nor participated in the destruction of the Maine. The dry gun-cotton primers and detonators were stowed in the cabin aft, and remote from the scene of the explosion. Waste was carefully looked after on board the Maine to obviate danger. Special orders in regard to this had been given by the commanding officer. Varnishes, driers, alcohol, and other combustibles of this nature were stowed on or above the main deck and could not have had anything to do with the destruction of the Maine. The medical stores were stowed aft, under the ward room, and remote from the scene of the explosion. No dangerous stores of any kind were stowed below in any of the other storerooms. The coal bunkers were inspected daily. Of those bunkers adjacent to the forward magazines and shell rooms four were empty, namely: B3, B4, B5, B6. A15 had been in use that day, and A16 was full of New River coal. This coal had been carefully inspected before receiving it on board. The bunker in which it was stowed was accessible on three sides at all times, and the fourth side at this time on account of bunkers B4 and B6 being empty. This bunker, A16, had been inspected that day by the engineer officer on duty. The fire alarms in the bunkers were in working order, and there had never been a case of spontaneous combustion of coal on board the Maine. The two after boilers of the ship were in use at the time of the disaster, but for auxiliary purposes only, with a comparatively low pressure of steam, and being tended by a reliable watch. These boilers could not have caused the explosion of the ship. The four forward boilers have since been found by the divers, and are in a fair condition. 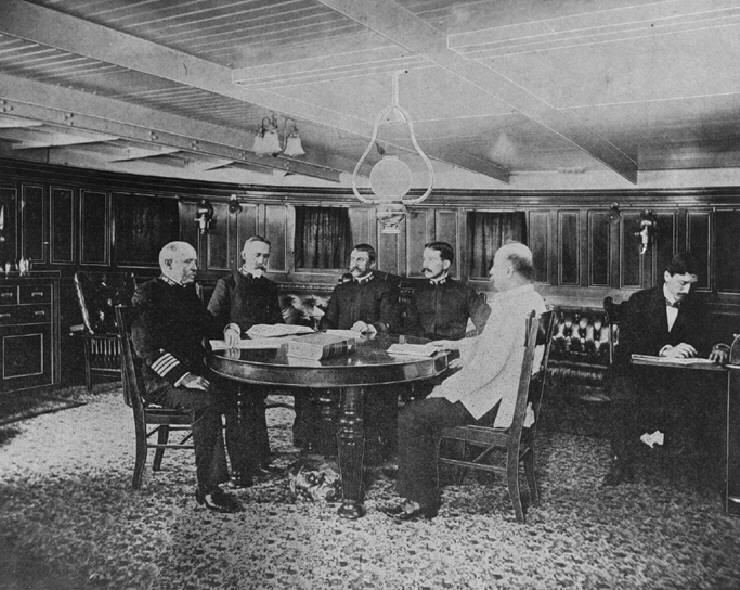 On the night of the destruction of the Maine everything had been reported secure for the night at 8 p.m. by reliable persons, through the proper authorities, to the commanding officer. At the time the Maine was destroyed the ship was quiet, and, therefore, least liable to accident caused by movements from those on board. 3. The destruction of the Maine occurred at 9.40 p.m. on the 15th day of February, 1898, in the harbor of Havana, Cuba, she being at the time moored to the same buoy to which she had been taken upon her arrival. There were two explosions of a distinctly different character, with a very short but distinct interval between them, and the forward part of the ship was lifted to a marked degree at the time of the first explosion. The first explosion was more in the nature of a report like that of a gun, while the second explosion was more open, prolonged, and of greater volume. This second explosion was, in the opinion of the court, caused by the partial explosion of two or more of the forward magazines of the Maine. 4. The evidence bearing upon this, being principally obtained from divers, did not enable the court to form a definite conclusion as to the condition of the wreck, although it was established that the after part of the ship was practically intact, and sank in that condition a very few minutes after the destruction of the forward part. A portion of the port side of the protective deck, which extends from about frame 30 to about frame 41, was blown up, aft, and over to port. The main deck, from about frame 30 to about frame 41, was blown up, aft, and slightly over to starboard, folding the forward part of the middle superstructure over and on top of the after part. This was, in the opinion of the court, caused by a partial explosion of two or more of the forward magazines of the Maine. 5. At frame 17 the outer shell of the ship, from a point 11½ feet from the middle line of the ship, and 6 feet above the keel when in its normal position, has been forced up so as to be now about 4 feet above the surface of the water, therefore about 34 feet above where it would be had the ship sunk uninjured. The outside bottom plating is bent into a reversed V shape (Ʌ), the after wing of which, about 15 feet broad and 32 feet in length (from frame 17 to frame 25), is doubled back upon itself against the continuation of the same plating, extending forward. At frame 18 the vertical keel is broken in two, and the flat keel bent into an angle similar to the angle formed by the outside bottom plating. This break is now about 6 feet below the surface of the water, and about 30 feet above its normal position. 6. The court finds that the loss of the Maine on the occasion named was not in any respect due to fault of negligence on the part of any of the officers or members of the crew of said vessel. 7. In the opinion of the court the Maine was destroyed by the explosion of a submarine mine, which caused the partial explosion of two or more of the forward magazines. 8. The court has been unable to obtain evidence fixing the responsibility for the destruction of the Maine upon any person or persons. The court having finished the inquiry it was ordered to make, adjourned at 11 a.m., to await the action of the convening authority. Off Key West, Fla., March 22, 1898. The proceedings and finding of the court of inquiry in the above case are approved. Rear Admiral, Commander in Chief of the United States Naval force on the North Atlantic Station.